A week ago on September 8 the Cassini spacecraft exploring Saturn made its last complete dive through the gap between the rings and the cloud tops, approaching within just 1044 miles of the cloud tops. Last Saturday, September 9, it sent its final set of data from the Grand Finale dives. Last Monday it made one last flyby of Titan, though this flyby was a distant 74,000 miles. On Tuesday we received the final set of Titan data and on Thursday afternoon, Cassini took its final image and then pivoted itself around to point its antenna to Earth and send the data home. After traveling for 83 minutes at the speed of light, the radio signals with that last image reached us. From then on we kept in constant contact with Cassini as it set itself up for the final data collection sequence where Cassini sampled Saturn’s atmosphere as it plunged into Saturn yesterday early morning. Cassini dutifully transmitted its findings as best it could until the atmospheric drag became too strong for the thrusters to keep the antenna pointed at Earth. It’s last transmissions never reached us as it began tumbling. Shortly after that it burned up. The Cassini team purposely ended the mission in this way while there was still fuel to control the spacecraft and to prevent Cassini from colliding with either Enceladus or Titan in the far off future. These two moons of Saturn have the environments for life and we did not want to risk contaminating these worlds with Earth microbes that might have survived the seven-year trip to and thirteen-year exploration of Saturn. The Cassini mission was a very successful mission. We knew we were going to be astounded by what Cassini would show us about Saturn, its moons and its glorious rings when it launched twenty years ago but it exceeded even those expectations by several orders of magnitude. I wrote the paragraphs above that gave a countdown to its last days with a bit of sadness because after thirteen years it had become such a dependable part of space exploration. Yes, it was “just” a robot explorer that did what it was programmed to do without emotion but it was an extension of ourselves. It put us there at Saturn, Titan, Enceladus, the other moons and the rings. We humans can become attached to the machines we create. For the thousands of scientists and engineers who worked on the Cassini mission through the past twenty years, magnify those feelings of loss by at least ten times. Another reason for a sense of loss is that there are no definite plans to go back to Saturn for the next ten to twenty years. We definitely need to send spacecraft with biochemical instrumentation to sniff and analyze the material in the geysers of Enceladus and scoop up the snow on its surface to see if life is there. Lessons learned from Cassini’s exploration of Enceladus will be used for NASA’s Europa Clipper mission that will launch in the 2020s. Europa is a moon of Jupiter that has an icy surface covering a deep ocean of liquid water and there’s suggestive evidence that it has geysers shooting material from that ocean into space. Next generation versions of Cassini’s instruments will be on the Europa Clipper mission and many of the scientists and engineers who worked on Cassini will bring their expertise to Europa Clipper. We also need to see if life exists in the methane lakes and rivers on Titan. Keeping with the space exploration theme, the first public evening show at the William M Thomas Planetarium will be Dawn of the Space Age showing this coming Thursday, September 21 at 7:30 p.m. Tickets are available from the BC Ticket Office and online from Vallitix. After that we’ll return to Earth and to California in particular with “Earthquakes: Evidence of a Restless Planet” on October 5. Jupiter is now lost in the glare of early evening twilight, so Saturn is the sole evening planet now. Between Saturn and the Teapot part of Sagittarius is the central bulge of the Milky Way with the dark lane of dust down its middle that hides the galactic center from our view (see the attached star chart). About 27,000 light years away in the direction almost exactly midway between Saturn and the tip of the spout of the Teapot is the supermassive black hole at the Galaxy center. That black hole is the star of the “Black Holes” show that will be given October 19 at the Planetarium. 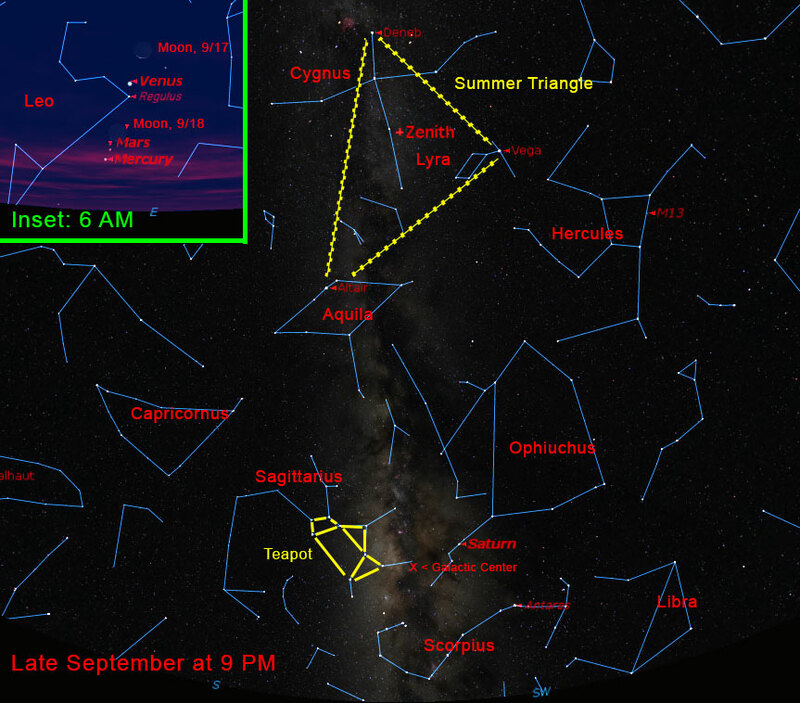 High above is the Summer Triangle formed by the bright stars Deneb, Vega, and Altair. In tomorrow morning’s pre-dawn sky, look for a super-thin waning crescent moon, ultra-bright Venus, the star Regulus, Mercury and Mars forming an almost vertical line close to the eastern horizon (see the inset in the attached star chart). Mercury and Mars are still less than half a thumb width at arm’s length apart from each other but Mercury is dropping fast back toward the sun. Autumn officially begins at 1:02 p.m. Pacific Time on September 22 with the autumnal equinox. The sun will cross over the celestial equator from the summer north side to the fall south side.